adot – eCommerce WordPress Theme has been released which fully supports WooCommerce Sales Countdown. VALENTINE’s DAY is coming and you are going to need this plugin to make great marketing campaigns. WooCommerce Sales Countdown is a fantastic plugin to promote your sale campaigns in WooCommerce. It shows a countdown box with the product on sale, to tell your customer how much time they have left to purchase your product with discount. You can also make it count the time till the up-coming sale period. WordPress 3.x and WooCommerce 2.x is required to install this lovely plugin for your shop. 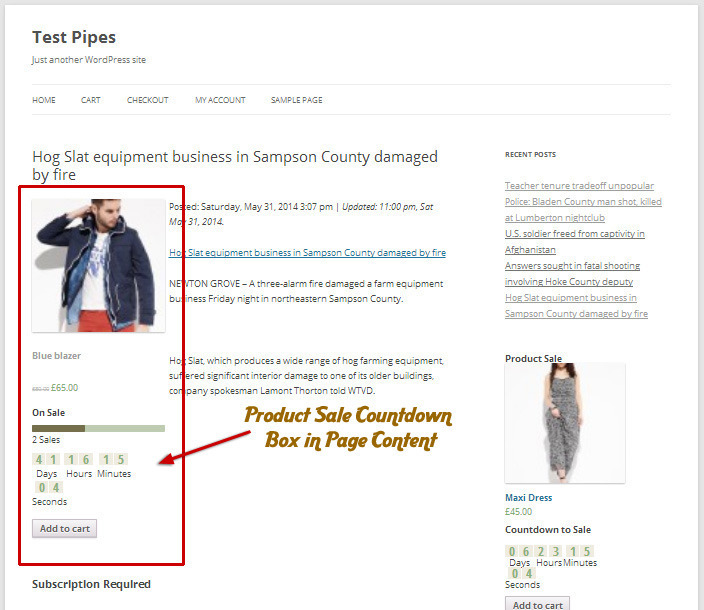 WooCommerce Sales Countdown can be used to boost your store’s sales. 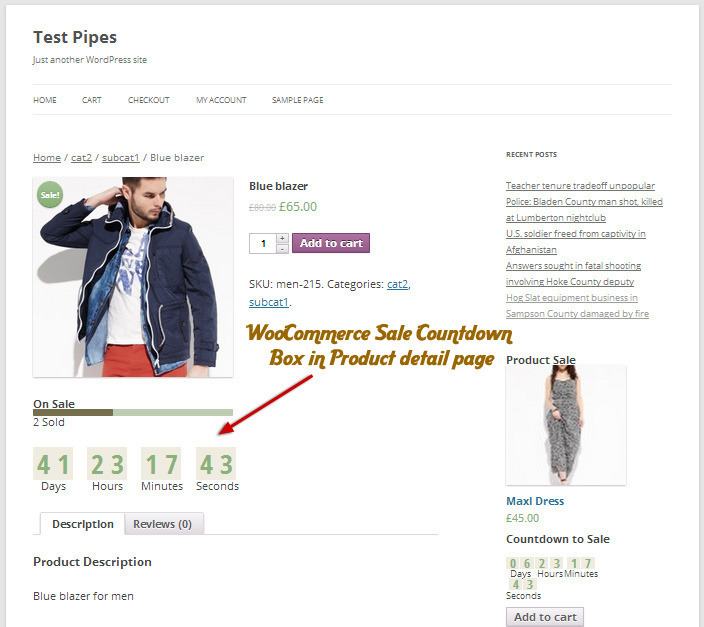 Sales Countdown / Timer / Scheduler on WooCommerce Category page. 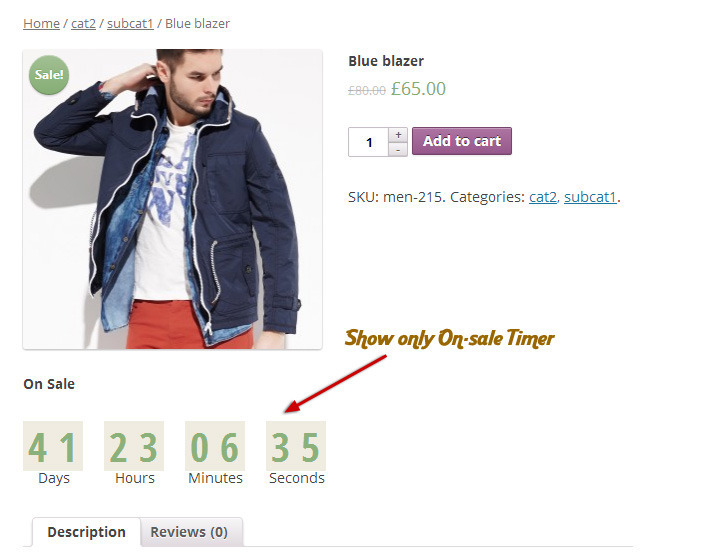 Sales Countdown / Timer / Scheduler on WooCommerce Product page. 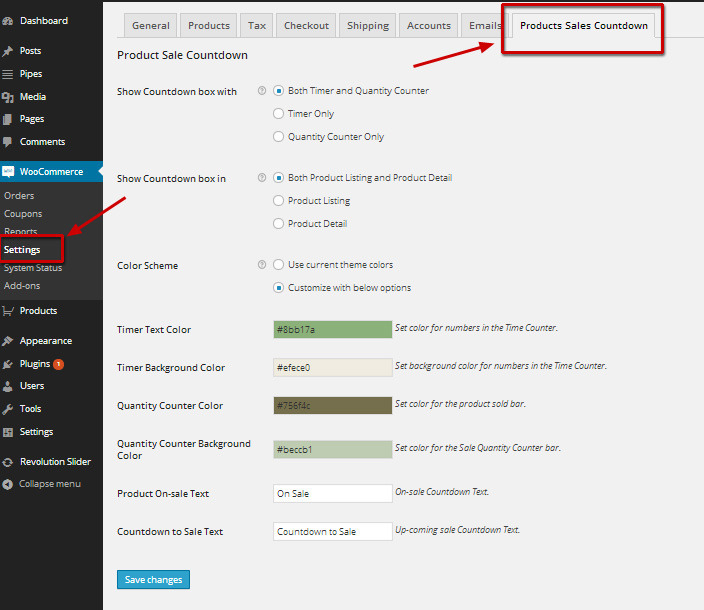 Sales Countdown / Timer / Scheduler on WordPress Sidebar widget area. Lightweight, optimized for the best performance. Minutely options right inside WooCommerce Settings area to save your time out of complex configurations. This WooCommerce Sales Timer compatible with every WordPress WooCommerce Themes. WPML (multilingual) ready. It can be translated to any languages you want. ~ Fixed: Setting CountDown position for List Products not stored. ~ Fixed: Fatal error on variable product page. ~ Fixed: sale price of variable product display not correct in cart. ~ Fixed: Price not display. ~ Fixed: bulk edit for Start date, End date, Start time, End time, Total product discount, Sold fields off variations product not work. ~ Fixed: Some variation product not display sale bar and countdown correctly. ~ Added daily sale price feature. ~ Fixed: Sale price still show after sale time is finished..
~ Fixed: Show wrong information in sale bar. ~ Fixed: Cannot save Total product discount and Total sold quantity of variable product. ~ Problem with 'absint' function on some Server. ~ Fixed: Edited the code for being compatiple with WP 4.3 and the newest version of Woocommerce 2.4.6. ~ Fixed: Could save "Hide only Sale Bar" or "Hide only Countdown" or "Hide all countdown and sale bar" options with each product. ~ Fixed: Update the quantity of sale when there is someone marks complete the orders. ~ Added: Allow setting up specified time for Sale schedule. ~ Fixed: Save post meta on product. ~ Fixed: Update sale with Variation products. ~ Fixed: Remove Counter & Sale Bar at review tab. ~ Fixed: Product variable on widget. ~ Fixed: CSS with hundreds. ~ Fixed: Fix add to cart Link in Shortcode and widget. ~ Fixed: Clear sale price when order succeed. ~ Fixed: Latin character in Product Sale Title. ~ Fixed: Sale Bar with WPML plugin. ~ Added: Sale Bar for variations option. ~ Fixed: Timer for Product variable in product detail. ~ Added: Option hide timer or sale bar on product detail, widget, shortcode, category. ~ Fixed: Product variable when loaded. ~ Fixed: Product variable on shortcode. 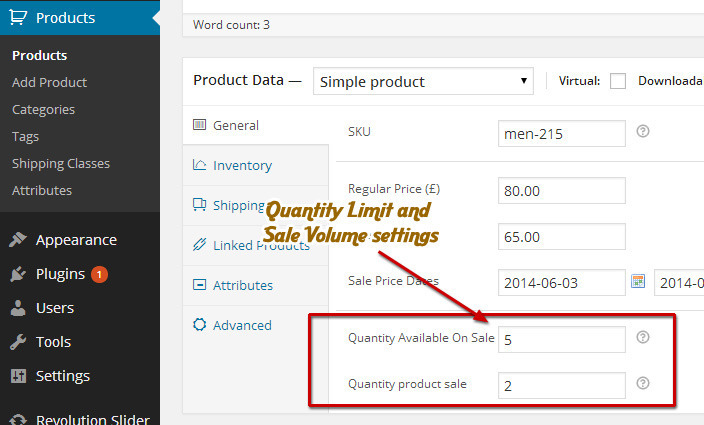 ~ Added: Bulk edit in variable product: Schedule, total quantity, total sold. ~ Added: Show countdown foreach product. ~ Added: Show time schedule. ~ Fixed: Quantity when checking out. ~ Fixed: Quantity update when payment paid successfully. ~ Fixed: Show product on widget. ~ Fixed: Show one time on product category. ~ Fixed: timer on related products. + Added: more options > hide product, remove sale price when schedule time expired. ~ Fixed: timezone. Time working with WordPress site's timezone. + Added: Product image sizes in WIDGET and SHORTCODE. + Added more positions in product details and product category. + Fixed: get meta and remove notice. 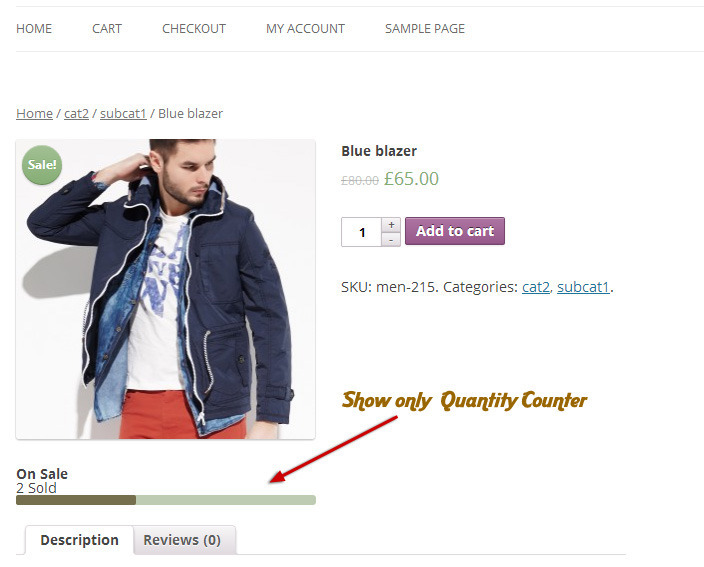 + Fixed: Show product if not product sale on shortcode and widget. + Fixed: product variable for shortcode and widget. + Fixed: language issue when active. + Code change to OOP. + Fix: CSS on responsive. + Fix: Can translate in WP backend. + Fix: Stock in product variable. + Fixed: Time follow server time. + Added: Setting for each field on Product widget and Product shortcode. + Added: Setting Show message, Show date text. + Added: Multi language file. It's now support WPML. ~ Fixed: shortcode support on widget. + Added: Product variable compatible. + Added: "Countdown Position" option to decide the position for the Sales Countdown on the Product Details page.